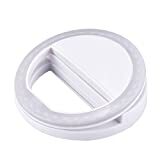 eBoot 36 LED ring selfie light supplementary lighting night darkness selfie enhancing for iPhone 6s Plus/ 6s, iPad, Samsung Galaxy S6 Edge/ S6, Galaxy Note 5, Blackberry and all phones or tablets. Light and small, can be easily carried in pocket or bag and shoot in wherever you want. Easy to use, clip it on the phone and turn on the switch, choose the brightness you need. Light is powered by 2 AAA batteries (not included). This entry was posted in Discount Photography and tagged eBoot, Enhancing, Light, Lighting, Night, Ring, Selfie, Smartphones, Supplementary, White by Ball Photo. Bookmark the permalink.